Traditional static websites often do not allow you to do much more than to read the content, contribute to a forum, email comments to the site owner or buy things. But a wiki is different; it is a type of website that allows some or all visitors to the site to add, remove and change pages and content very quickly and easily. 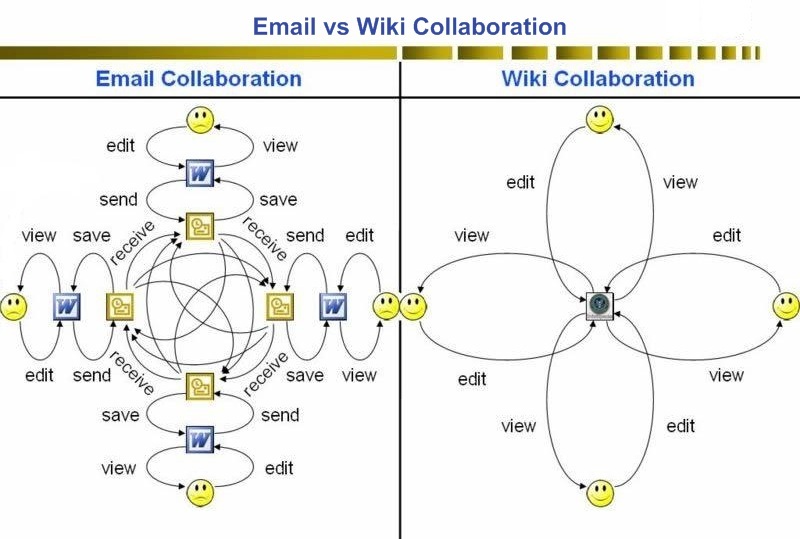 This wiki/email comparison image was originally produced by Manny Wilson in June 2007 for a presentation to senior leadership at the United States Central Command to demonstrate how wikis could be used to more rapidly draft contingency plans. One advantage of a wiki over a traditional website is that the responsibility for making changes doesn't rest with just one person, it becomes a group resource and everyone has a stake in it and a contribution to make. Making changes and adding content can become quite addictive and good fun. Where did wikis come from? The name "Wiki" was inspired by the Hawaiian word wiki or wiki-wiki, which means "quick". The first wiki was developed in 1995 by an American, Ward Cunningham, who wanted an alternative to the word "quick" for his product that would allow quick, collaborative editing. He remembered the wiki-wiki shuttle buses that run between terminals at Honolulu International Airport and the name stuck. Wikis are now used extensively in education for class work, assignments and projects. Many community groups also use wikis to enable local residents to promote their town or village as a group without one person always having the responsibility of keeping it up to date. In business wikis are now used by many of the world's most innovative companies for team collaboration, co-authoring of documents (it avoids long email chains and makes collaboration much easier), knowledge management and intranets, event planning, contact with customers and for project work. What are wikis used for? and created by RobElliott - thanks to him!